Getting people to read content on anything other than traditional medium, like books, magazines and newspapers is always a challenge. Those who publish content online, and website owners and webmasters have known this for a while. But now there’s a new challenge – mobile devices. They are everywhere these days. And not just that, people are visiting the Internet from these devices as well, and reading web content. Web marketers and online content publishers simply cannot ignore mobile devices. That’s because, if you analyze website traffic, you will see that a sizeable portion of it is already coming from mobile devices. With the prices of smartphones, tablets and other mobile gadgets becoming cheaper every day, it’s certainly going to be a lot easier for people to buy them in the future. It is estimated that in the next couple of decades, even the most remote places in the world is going to be connected online. So the percentage of visitors from these gadgets is expected to grow remarkably too. This presents a unique problem for online content publishers. These gadgets have a smaller screen than your average laptop or desktop, and so, it’s not always easy to read content in this format. A recent study reveals that it’s 108% harder to understand information on a mobile screen. A common observation is that, people are usually rushed when they are using their mobile gadgets. So how do you serve content for these devices to make it easier to read? After all, “Responsive Web Design” won’t fix the content issue. – Think of creating content on other platforms that are very good for mobile. For instance, Vine and Instagram are both great for visual content. It’s so much easier to consume and share. Your content should have minimal markup so that a web content management platform can manage the display styles across different devices. Scrolling is always going to be more natural when compared to pagination on mobile gadgets. If pagination is going to be better for your content, then at least ensure that readers on mobile have to swipe through the pages and not click on really small links to visit the next slide or page. Card-based designs (where your web page looks much like the layout of a card) are getting very popular on mobiles, and also for desktop website designs. Here you are essentially taking small pieces of information – a teaser, headline, and placing them as independent entities. 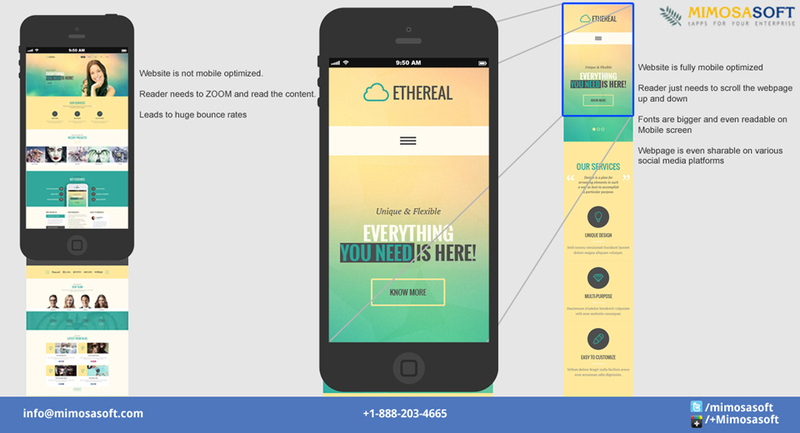 You are optimizing the placement of high-value information in the available viewable space. Images where are details are important do not create any impact on small screens. So to feature the subject, keep the image closely cropped and the file size small. Like images, your headlines should also be shorter for the mobile version. The content should take up less space. You should serve fewer lines. So get to the point quickly. Readers should be able to read up the rest of your content quickly too. A detailed analysis may not be too well taken on mobile gadgets. Remember, it’s important that you serve the most important content fast. Don’t defer, because most people are not going to see the secondary screens anyway. And, don’t make your first screen extremely dense. Nobody likes to read this on their mobile devices. So focus on the first screen. Get straight to the point, serve only what is needed, use small sentences and paragraphs, and allow users to dig up what they need to learn easily. You will make it easier for them and your mobile content will give you more business value.